This is an independant review that was not paid for, nor endorsed by Casa Luna Cooking School. I paid for this class when on holiday in Bali. One of my favourite things about my trip to Bali was indulging in traditional Balinese food, and boy do the Balinese really know how to cook! I wanted to learn some of their skills so I could take a piece of Balinese culture home with me. Myself and a friend decided to book a cooking class at the popular Casa Luna Cooking School in Ubud. We hired a driver for the day from Kuta, where we were staying. The school had been recommended to us by our travel agent and after some Googling, I found Casa Luna was named one of the ‘world’s best cooking schools’ in The Australian. My friend and I enrolled in the 3-hour, Friday Beginners Casa Luna Cooking Class. Little did I know, this one class would change the way I prepared meals forever. A different class from the above list runs every day. 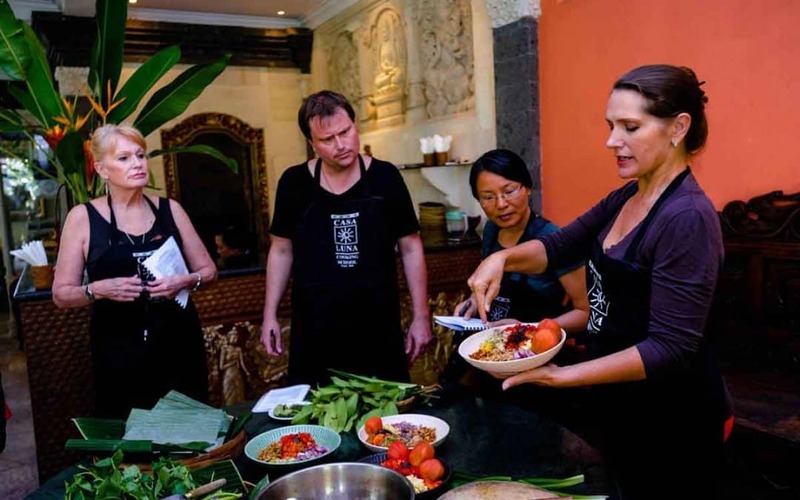 The Friday class is the best cooking class Ubud has to offer for beginners. 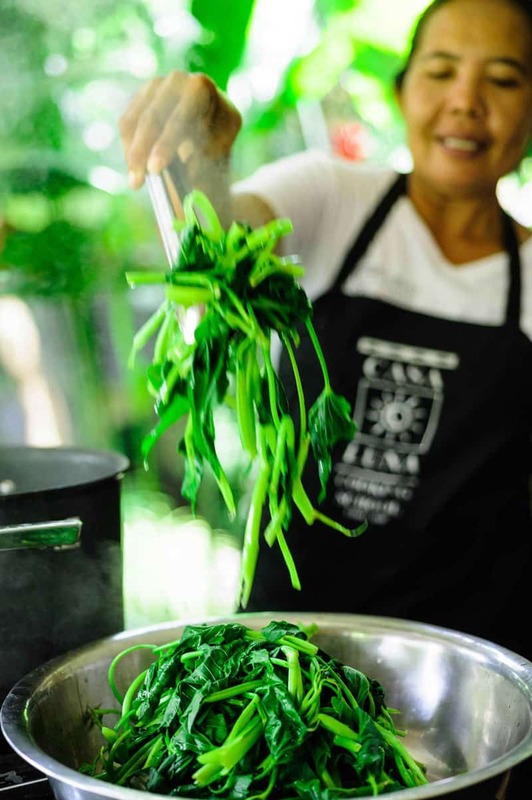 Casa Luna Cooking School is owned by Janet DeNeefe, who has been teaching Balinese cooking for 30 years. She also initiated the Ubud Food Festival. Tourism in Ubud has boomed ever since Elizabeth Gilbert’s memoir Eat, Pray, Love inspired a nation of solo female travellers. Ubud was the town Gilbert lived in when she spent the latter portion of her adventure in Bali. It’s not hard to understand why! When we arrived we were given a refreshing hibiscus cold drink while we explored the tranquil grounds. The cooking school is nestled in the middle of a huge, leafy garden (which I am tempted to call a tropical rainforest) complete with beautiful Budda statues and sculptures, glorious fountains, and pools. If you think you’ll be stuck in a hot, stuffy kitchen- you’re wrong. You are cooking with one of the most sensational views in Bali! 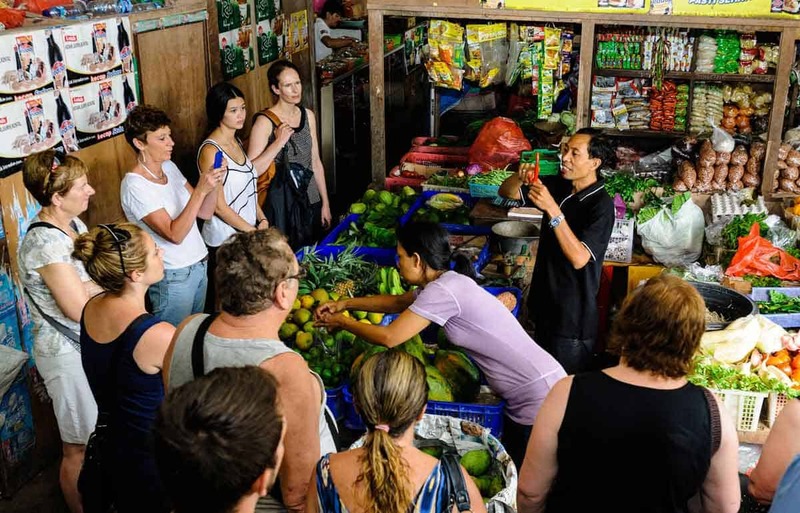 Casa Luna Ubud cooking classes take you to the local markets to purchase your own ingredients. Ingredients for the cooking school are sourced from local markets. Many of Casa Luna’s classes will actually take you on a market tour to shop for your own ingredients to cook with. The class we’d enrolled in didn’t include the market tour, however the use of each ingredient was explained to us. 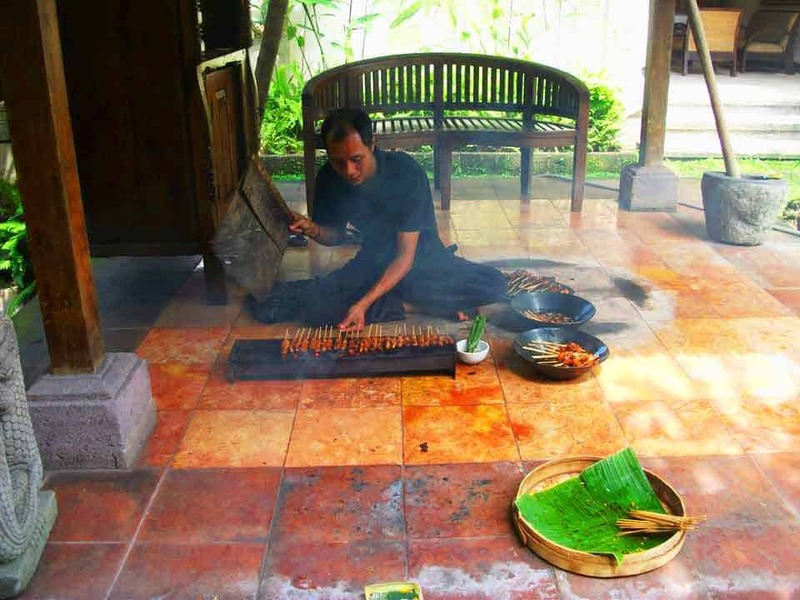 The Balinese make all of their meals from scratch, using fresh ingredients. They cook with coconut oil, which they like because it promotes the health of the heart. It is high in natural saturated fat which increases the healthy cholesterol in your body. Once we had been given the theory behind the ingredients, it was our turn to help prepare them. You could do as much or as little as you liked in this class; the assistant chefs were always on hand to offer assistance. I enjoyed getting hands on and crushing the hazelnuts that would eventually be made into a delicious peanut sauce. In our class, we also learned how to make the rice dish Nasi Goreng, Chicken Satay, Krupuk (deep fried crackers), and a delectable ‘Fruit in Coconut Milk’ dessert. We also learned how to use shrimp paste, an ingredient I would usually steer clear of due to its interesting (!) aroma. Suprisingly, it added a fantastic flavour to our meal. One thing to take note of is that is can get very warm because you are cooking in a tropical environment. Remember to drink plenty of water and wear light, loose clothing. This wasn’t just a cooking class, it was a full immersion into Balinese culture. Topics such as spiritual practices were discussed, including why the Balinese put tiny baskets with assorted flowers and petals on their doorstep (they are essentially an offering meant to appease and please the various gods and demons of Balinese Hinduism), family life, and gender roles. We were given a booklet at the conclusion of the class with the recipes we had learned. One of the best things about this class was that when I returned home, I invited my friends and family around to share what I had learned about Balinese culture over a delicious three-course meal. You can learn more about the Casa Luna Cooking School and book a cooking class by visiting their website. Have you tried one of the Casa Luna Cooking Classes? Leave a comment with your experience below! Sounds like an amazing experience! I would love to go on the market tour – markets (especially in Asia) are so colourful and lively. How did your food end up tasting? It was incredible- the way the Balinese cook is quite spectacular. 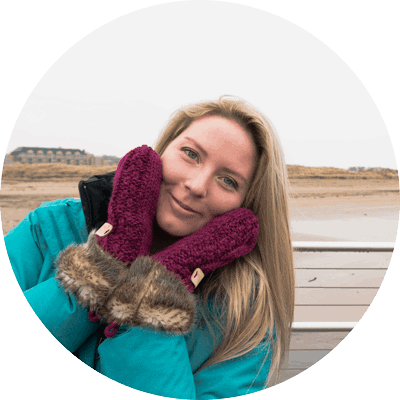 I went to Bali feeling yucky and bloated from eating processed food and when I returned to New Zealand I had lost weight and my gut health was amazing from eating so much fresh produce. Going there truly changed the way I cook. I love cooking classes, it broadens your horizon so much! And I always enjoy trying different tastes. Seems we share a passion for food. The cooking class sounds very interesting. Nasi Goreng is also well known in the netherlands. Satay and krupuk as well. But I would be very eager to know how it tastes in Bali with fresh ingredients. I am sure it is much better than the dutch versions made from supermarket stuff. I absolutely Loveeeeee Balinese cuisine ? My favorite is the Nasi Goreng ? Great post, I’d love to go back someday. I feel like you need to have a really good sense of flavours when cooking, particularly Asian food! I struggle to make a good scrambled egg on toast! Cooking is something I would love to learn one day though. I should really take up cooking classes in places that I visit. I think it’s a window to a place’s culture and traditions. Shrimp paste is a favorite of mine, my Greek husband hates the smell of it but it’s an appetizer for me. Lol. Wow! So exciting I am headed to Bali next week and I definitely want to check this out. I love cooking. I went to a class in Thailand that was very similar and I really enjoyed it.